When kids start feeling overwhelmed, a calm down jar of liquid and glitter can help them settle down. They can shake it up and watch the glitter settle to the bottom of the jar. They can be mindful in the moment by counting out loud how long it takes. They can observe how quickly or slowly the glitter falls, and focus their thoughts on the path of the glitter instead of the overwhelming feels. There many of mobile phone apps that can help with mindfulness and meditation. One of our favourites is The Bodhi Tree & Stacey. Through stories written and narrated by Stacey coupled with the guided meditation, children are encouraged to use their imagination to discover their own inner calm and tranquility. Incorporated into each story is the concept of metta, a loving kindness practice used to evoke a boundless warm-hearted feeling towards themselves, their loved ones and each of the creatures they meet. For Children over 10, the Calm app has guided meditations that can help your child meditate and focus their attention away from stressors. Put some headphones on to block out distractions and dim the lights. Have your child lay on a yoga mat on the floor and just chill out. On the west coast, there’s rarely a shortage of rain. On a rainy day, plant your small child in front of a window and have them watch the drops slide down the window pane. Encourage them to notice how quickly or slowly the water moves. Direct their attention to the sound of the rain falling; have them listen for variations to the speed and intensity. If there’s thunder, have them count between the rumble and the flash of lightning. Bring nature into their awareness by focussing on the weather and delaying impulsive behaviour. Have your child lay down and focus on each part of their body, one at a time. Have them notice their toes, scrunching them and relaxing them. Have them imagine their feet are falling asleep. Repeat this sequence through their whole body from their toes to their heads. Bring their awareness into their body and away from the feelings that are overwhelming them. Grab a bottle of bubble solution and dip a wand in the liquid. Have your child blow a bubble with the wand. Ask them to notice the colour of the bubbles when the light hits them. Get them to notice the shape of the bubbles, how quickly they drift towards the ground and if they pop before or after they hit the ground. Next, take a balloon and have them blow their big feelings into the balloon. Have them notice the way the air fills their lungs and how big the balloon gets. Get them to visualize the big feelings leaving their body and entering the balloon. Release the big feelings from the balloon into the air or tie a knot in it to keep them safely contained until they can be addressed later when things are calmer. 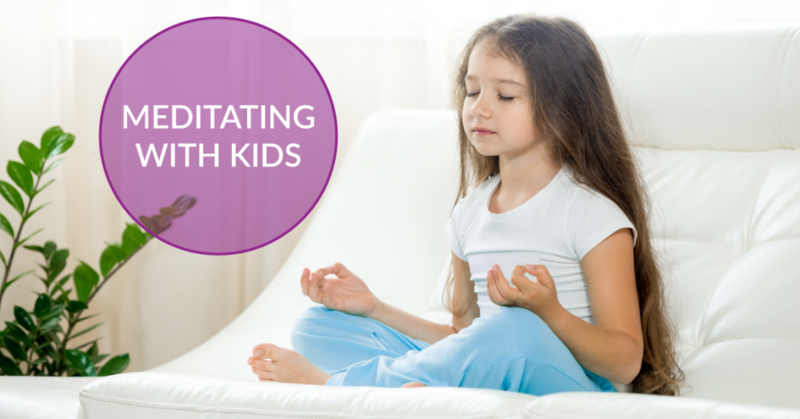 Meditating with kids can be such a helpful tool to get big feelings under control. Whether you’re big or little, being mindful and meditating can bring you more into the present and your surroundings. It is so easy to become distracted in a fast-paced world, but meditation brings you and your child into the now. Now go get your zen on! Metro Vancouver Experience Gifts for Adults & Kids Remembrance Day Activities for Kids Healthy Slow Cooker Recipes for Busy Families!